Being an artist in this digital age is nothing short of amazing. I can send photos to galleries and customers across the world in the blink of an eye, swap stories and ideas with artists I’ve never met, have a image gallery of my current work accessible at a moments notice, and sell my work via a small metal box filled with chips and screws. Maintaining a digital presence has been an integral tool in my art practice, and being online has opened so many doors for my work. But not everything is online. It’s important to have some physical records of our work too. Things we can hold in our hands, share tangibly, and have a real face-to-face conversations over. One of these things is my actual, printed, physical portfolio. The experience: I like books. I love my kindle and do *most* of my reading digitally nowadays - but certain, special books demand a physical copy. I can’t read Tolkien on a screen. Flipping through actual pages, holding the object in my hands is a different level of interaction and it gets stored slightly differently in my memory. 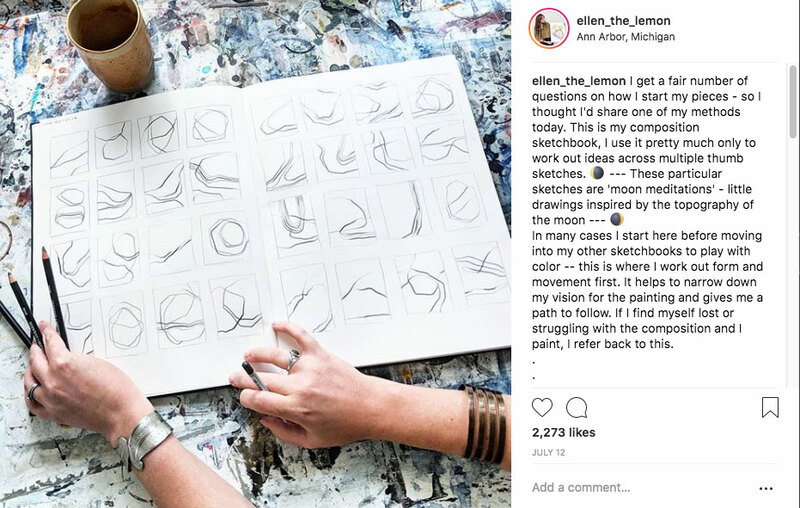 This translates to using a physical portfolio - I can share it with customers, refer to it during gallery meetings, pull it out for open studio nights, have it on a table during art shows, and yes it’s more-or-less the same thing as having a screen up with my website - but a book is experienced differently. It allows the viewer to flip through it at their own pace, no digital navigation to contend with and lets them have a more personal interaction with my work. For my records: I exist in a constant state of organized chaos. My studio is *usually* a mess, but I know where everything is. My work is spread out around the house, a storage unit, galleries and venues, and in private collections. I have a mental list of where some of my favorite pieces now live, but it can get muddy with new collections and new shows. My website changes and updates frequently enough that keeping a dedicated “favorites” corner doesn’t really make sense - even if it’s just for my own records. Enter, my portfolio. In addition to being a book that showcases my best work, it also serves as a physical collection of some of my favorites. When i finish a painting that I feel is particularly strong, or answers a question that’s been hounding me for awhile - I photograph it, print it and load it into the portfolio. Depending on page count I’ll either replace something older, or add a new page. What results is a book that I am proud of, that serves as a reference for me personally. I debated about getting one printed and professionally bound and all that fancy jazz - but realized I change and update it too frequently for that to be a financially sound choice. So I picked out a slim, black classy binder with tight spiral binding and nice shiny page covers. For each page I added a sheet of black card stock, one to add some thickness to the page and two for giving each printed image a black border. Gather your images! Once you have a good collection of 15 - 20ish, find a trusted friend or mentor to help you narrow then down. For books like these (designed to be a summary of work) I like to keep it at 12-14ish - not so many images that it’s overwhelming, but enough to give a good idea of my work. Pick your form factor. I went with an 8.5 x 11 book, though I almost picked an 11 x 17. In the end, I decided to go a little smaller for portability - but I love the look of the bigger books. Gather your materials! Get your images printed, or purchase the paper to print yourself. I don’t use super fancy paper for this, just something that looks professional, reproduces the colors well and is relatively thick. Archivability isn’t a huge concern here, this is just an overview of my work - nothing I’m going to turn around and sell. Make a cover page! Use this as an introduction to you as the artist and your work. Think of the book on a table at an art show by your paintings, but you’re talking to a guest across the room. What do you want them to know? I include a bit on my process, my statement and my contact information. It speaks for me when I can’t. Consider a price page! At the very end of the book I have a page with titles, sizes, mediums, availability and depending on the event - prices. Sometimes I leave the prices out, sometimes I add them in - just depending on where I’m at. Do you keep a portfolio already? How do you use yours in your practice? Also if you have any tips for artists just starting theirs I’d love to read them! I work out a studio in my home. Most of the time I love it; there’s no commute, no dress code, no weather to handle, just a groggy walk across the living room floor to the kitchen for coffee and a slow shuffle into the welcoming walls of my studio. But it’s not always ideal. In-home studios come with their own unique challenges and complications, and as I’m currently displaced from mine — I thought I might share a little bit about the current project. We’re in the process of fixing/replacing the caulked and painted shut windows in the house, and the next batch up is my studio. I’ve spent the last few days clearing everything out of the room to allow the work to begin, while simultaneously wrecking the living room with an influx of supplies. I know the windows don’t look too bad in the nice bright photo, so here’s a close-up; they definitely are in need of some love. As an artist that relies so heavily on light and patterns in the light I’m so excited to get these restored. 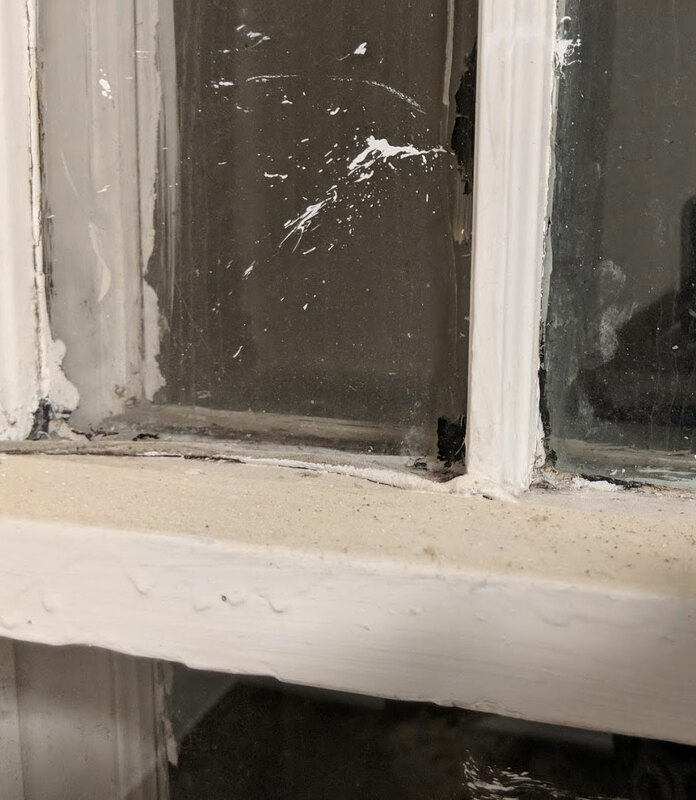 To have the broken glass replaced, the paint spattered panes cleaned, the mechanisms fixed so I can actually open them. The few we’ve already done look so incredibly clear, I can’t wait to see how much light will fill my workspace. But for now, this means meetings are conducted somewhere else quiet (in the car!) and I’ll be painting outside until the carpenters finish their work. In the end I know the hassle will be worth it. Renovation in the studio - means meetings are held in the car! My favorite paintings to work on usually are borne out of two conflicting modalities; Chaos and Order. The push and pull between the two forces drives a lot of the interaction and movement of my work - and it’s something I only “half” control. I control the sketches, the fine details, the colors of the paints I mix - but I don’t control the way the paint moves on the surface. I don’t control the spills, the drips, the intermingling of pigment and resulting colors. Working in this intuitive way imparts a focus that I haven’t found with another process. The work is informed by the process and the process informed by the work. It’s a cyclical opposition that relies heavily on my space and tools. My studio is in a building that pre-dates 1891 and the floors show it. There is a 2.5 inch slope from one side to the other, which doesn’t seem like much - but when you are working with water media it’s very noticeable. I absolutely could have evened the floor out, but chose to accept another facet of the unplanned; gravity was going to change my work. When I put down a pool of paint it runs downhill. I can leave it as it, or spin the work to change it’s course, but that is about the extent of my control. I can’t leave a work unattended either, as sometimes in the drying process areas of the painting will overflow into another, pushing the paint down the canvas. This has resulted in a relatively different studio experience for me - rather than leave as a work dries I now sit there (usually with another painting or some other facet of my job that needs doing - like blogging!) and literally - watch. Paint. Dry. Sometimes I catch the drips and move the painting, sometimes I happily let them spill all the way down, grabbing other colors as it moves. It’s another part of the chaos and I love it. My tools also have a part to play in the balance between planned and unplanned. Probably best characterized by my two favorites; the loose hake brush and the precise rubber wedge (or squeegee). I frequently have one in each hand and move the drying paint around with both, one making hard to control splutters of the pools, the other cutting through and leaving small, tight lines in it’s wake. It’s in their interaction that I learned to love and embrace the dichotomy of chaos and order and begin to seek it out as I worked. And then, I saw it everywhere. The flower growing in the crack in the cement; just a flower in a field - but here in this moment it’s transformed into something miraculous. But I have to love it loosely. If I let myself get too caught up in the order aspect and find myself ‘planning’ the chaotic elements, I lose that magic that the flower possesses. Then the work is an exercise in making something look ‘unplanned’ and in my mind, fails at it’s purpose. Allowing my tools and my space to contribute their essence and spirit to my process has made for a far more fulfilling and challenging studio practice. I’d love to know more about your practice - do your tools inform your work? Does your space change your paintings? Leave me a message below!